The eighth song of Hamilton – An American Musical is “Right Hand Man.” In this song we meet George Washington, and the friction between Hamilton and Burr is introduced. The song begins, “British Admiral Howe’s got troops on the water. Thirty-two thousand troops in New York Harbor.” British Admiral Richard Howe, brother of the General William Howe (who was prosecuting the war on land), did indeed have about 32,000 troops in New York Harbor. Those soldiers landed on Staten Island by early August 1776. Hamilton then reminisces, “As a kid in the Caribbean I wished for a war,” because he knew it would be a way for him to rise up in society. As mentioned in part two of this series, Hamilton did “wish there was a war” in a 1769 letter to his friend Edward Stevens, when Hamilton was still an orphan child on the island of St. Croix. After Burr and the company introduces George Washington, the general sings, “We are outgunned, outmanned, outnumbered, outplanned,” and he wasn’t lying. On August 26, 1776, before the Battle of Long Island (aka Brooklyn), the entirety of the American army in and around New York City was just over 27,000 men, including sick, and others who couldn’t be counted on to fight. The British had 31,625 men in the area. A couple of verses later, Washington sings, “Any hope of success is fleeting; how can I keep leading when the people I’m leading keep retreating? We put a stop to the bleeding as the British take Brooklyn.” The Battle of Long Island was a disaster for the Americans, who had two generals captured during the fighting. Following the battle, the American army retreated to Manhattan, but they wouldn’t stay for long. Hamilton sings next, “They’re battering down the Battery check the damages.” Hamilton’s artillery company was posted at the Battery, at the southern tip of Manhattan Island, for some time before the attack. The American army beat a hasty retreat northward. With the British already commanding the western shore of Manhattan, if they cut off the American retreat to the north and east, the Americans would be trapped on the island. Next in the song, Washington recounts the retreat and battles interspersed with the company yelling “Boom!” First he sings, “We’re abandoning Kips Bay,” followed by “There’s another ship and we just lost the southern tip and we gotta run to Harlem quick.” All of this did happen. General William Heath recorded in his memoirs (which he wrote in 1793) under the date of September 15, 1776: “About noon, the British landed at Kipp’s Bay. They met with but small resistance, and pushed towards the city of which they took possession in the afternoon.” At about the same time, the British also landed at the Battery and took Fort George at the southern tip of Manhattan. As for the ships, the British had ships in New York Bay, and had been running them up and down the East and North (Hudson) Rivers for weeks. On September 13th and 14th the British sent seven or eight ships up the rivers, and cannonaded the American positions on shore. Washington described much of this, and the American retreat to Harlem, in a letter to John Hancock, dated September 16, 1776. Washington next sings, “We ride at midnight, Manhattan in the distance.” The Americans fought the British again at Battle of White Plains, on October 28, 1776. Following that battle, the Americans controlled only Fort Washington and the surrounding area (present-day Washington Heights). On November 12th, Washington crossed into New Jersey. On the 16th Fort Washington fell to the British, and the American army began to retreat across New Jersey. The musical then breaks away from the battle scenes and enters Washington’s offices, and as he sings, “I cannot be everywhere at once, people, I’m in dire need of assistance,” Burr enters, and the General asks, “Who are you?” Washington had a number of aides on his staff at all times. In fact, Burr briefly served on Washington’s staff in June 1776 before being transferred to General Israel Putnam’s force to serve as his aide. Therefore, Washington would have known who Burr was at this time. Still, Burr responds, “I was a captain under General Montgomery until he caught a bullet in the neck in Quebec.” Burr marched to Quebec with Benedict Arnold’s expedition. On November 30, 1775 Arnold sent Burr as a messenger to General Richard Montgomery (who had recently taken Montreal from the British) with a letter of introduction. Montgomery liked Burr immediately, and made Burr a captain and one of his aides. The Battle of Quebec was fought a month later, on December 30, 1775. Montgomery was joined by a force commanded by Arnold in the attack. Arnold was wounded in the ensuing battle, which the Americans lost. Burr escaped capture, as did Arnold. Montgomery was not so lucky; he was killed by grapeshot. Then Washington asks Hamilton to join his staff – “I need someone like you to lighten the load. So?” A letter that was sent from Washington to Hamilton on January 20, 1777 has never been found. It is assumed that in this letter Washington asked Hamilton to join his staff. The appointment was officially announced in the General Orders of March 1, 1777. Hamilton accepts – “I am not throwin’ away my shot!” and sings, “You need all the help you can get. I have some friends. Laurens, Mulligan, Marquis de Lafayette” and suggests, “We’ll need some spies on the inside.” John Laurens did join Washington’s staff later in 1777. He received a letter from Washington dated August 5, 1777 asking him to “do me the honour to become a member of my Family.” The General Orders of September 6 made the appointment as an “Extra-Aid-du Camp to the Commander in Chief” official. Hamilton may have had something to do with the appointment of Laurens, although Laurens father held a high spot in the new government as well, which couldn’t have hurt his chances. Lafayette, as noted in part two of this series, arrived in North American on June 13th and was appointed a Major General by Congress on July 31st. 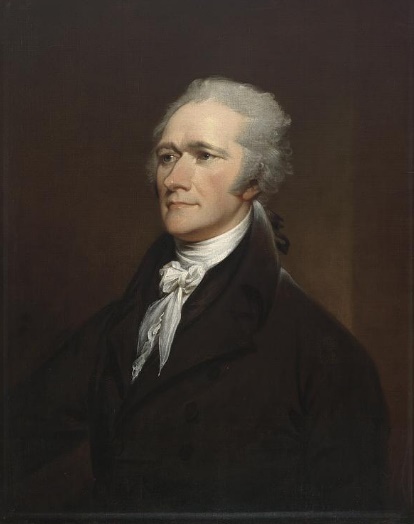 Hercules Mulligan, who Hamilton had known since arriving in New York, stayed in the City when the British occupied it and worked as a spy for the Americans. For information on Washington’s war-causing blunder, see a letter from George Washington to Robert Dinwiddie, 29 May 1754, and a letter from George Washington to John Augustine Washington, 31 May 1754.